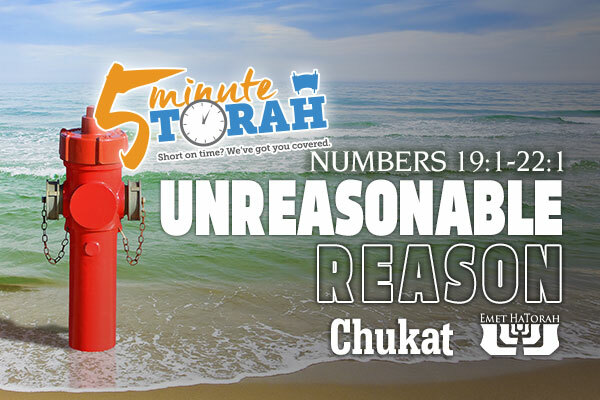 Generally, chukim (statutes) are a classification of laws within the Torah that are given with no real clear understanding as to why they exist. They are laws without reason. For instance, in this week’s parashah we have the ritual of the red heifer. How does mixing the ashes of a red heifer, some cedar wood, hyssop, a string of crimson wool, and water create a concoction that can remove even the highest level of ritual impurity? Specifically, how does this mixture, when sprinkled on someone who has been contaminated by death, make him ritually pure again? The reason this procedure works is beyond human comprehension. Another example of a chok is the prohibition against mixing wool and linen (Deuteronomy 22:11). Why does the Torah prohibit this mixture to be worn? Is there something inherently evil about the combination of these two fibers? Does it drain the energy from a person? Many times we try to make sense out of the various chukim given to the Children of Israel. We try to apply human logic to something that is not of human origin, and explain a particular law in ways that help us make sense of it. However, if we examine our reasonings, they really have no Scriptural support. For instance, many people have tried to apply human logic to the dietary laws found in Leviticus 11. Many claim that the Torah’s prohibition of pork was due to a lack of cleanliness and refrigeration in the biblical period. Since we have these things in place today, and since our government approves “the other white meat,” they believe and teach that the laws forbidding the consumption of pork are therefore no longer valid. A similar logic is often applied to the prohibition of eating any seafood or fish lacking fins and scales. Catfish and shrimp are primary examples. This logic says that since they are bottom feeders, they are rendered unclean by the Torah in order to protect humans from the filth they consume. However, this logic fails when we consider the common carp. Even though it is also a bottom feeder and scavenger, according to the Torah, it is classified as a kosher fish because it contains both fins and scales. Hashem asks us to obey His commandments not because we understand them, but because we trust Him and His wisdom. We obey the chukim simply because Hashem said to do them. Once we begin to rationalize the commandments, we bring God down to our level. The moment we believe our wisdom begins to supersede His is the moment we have eaten of the Tree of the Knowledge of Good and Evil and the Holy Scriptures become relegated to our own imaginations. As we have said, chukim are not necessarily designed to make sense. They are, however, designed to provide us opportunities for obedience and remind us that ultimately, Hashem is in charge and we are not. The next time we are tempted to rationalize a commandment in the Torah on our own terms, we should remember to recognize and appreciate the vast difference between Hashem’s wisdom and our own, and walk humbly in obedience to the wisdom of our omniscient Creator.